Starting from Oct 22nd, 2012, the Second Wolmyungdong Rock Gem Festival is going to be held for a month at the Wolmyungdong Natural Recreation Center by the Christian Gospel Missionary (head chairman: Pastor Jung, Myungsuk). 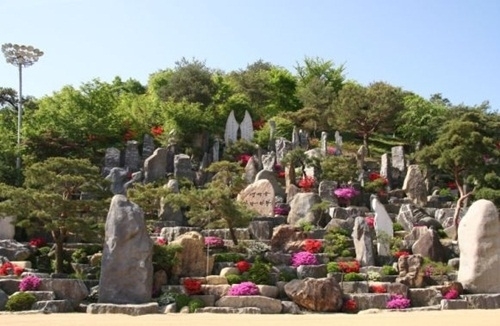 The Rock Gem Festival, which started in 2011, had over 40,000 visitors during the first festival and is set as an annual event along with the WolMyungDong Flower Flower Festival, which begins in May, 2011. The WolMyungDong Natural Recreation Center, located at the clear zone of Choongnam Kuemsan Gun Jinsan Myung, was built with a design that did not damage nature but vitalize its beauty as much as possible. Its unique feature is the rock landscape that was built with Chairman Jung’s megalithic landscaping construction method. This event is planned to prepare various programs to think about the value of life while seeing not only the trail, which is in harmony with the pine trees and other various kinds of trees, but also the rocks that show nature’s natural beauty as the way it is.